Take a 12-man bicycle fuelled by beer and add blaring music and flashing lights to get – the BeerBus. Set to hit Krakow’s Old Town soon, the BeerBus invites customers to hop onto bicycle-style saddles and pedal themselves on a beer-swilling odyssey around the ancient streets of Poland’s royal capital. Tickets cost 10zł, but the beer is free because the BeerBus does not yet have a license to sell alcohol. There is also a question mark over whether the BeerBus is allowed into the Old Town’s traffic zone at all, because city police are not sure how to classify it. According to Gazeta Wyborca, the BeerBus’ first attempt to add peddling and piwo to the beauties of a World Heritage Site was thwarted last weekend when the Straż Miejska pulled it over and imposed a 100zł fine. Mariusz Kryk, the owner of BeerBus, told Gazeta Wyborca: “According to the law, we do not need special permission because the vehicle is a bicycle. Our customers are not consuming alcohol in a public place [illegal under Polish law] because this is a private vehicle,” he added. The BeerBus may be privately owned, but it is far from private. YouTube videos of shirtless lads propelling similar vehicles around Amsterdam, Budapest, Berlin and other ‘stag-friendly’ destinations provide Cracowians with a taste of what to expect. Drinking and driving and yes, take it to a public space and it is public. Mobile drunks are not pretty so it would be wise to get this hunk of junk off the streets. How often do people fall off these things? Where do they stop for beer potty breaks? It would be a good idea to test the person who steers for sobriety. Do not make it happen because if it smells like trouble, it is trouble. 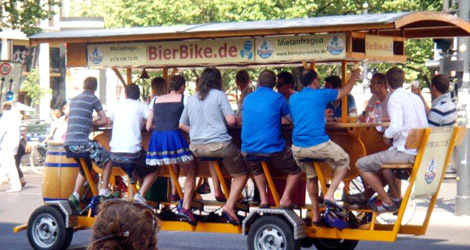 We are wanting to rent such a beerbike this friday in Krakow at 5pm. Do you know if there is such a possibility?! If anyone knows, please reply asap!